There can be NO symmetric TIB single loop ! ( There are numerous symmetric TIB double loops, and one can easily tie some new ones, by manipulating two bights like they were ends, i.e. by tying with-the-bights - but he should nt waste his time trying to disproof what could had been a mathematical theorem. I had tried to offer a decent hand-weaving argument supporting this in the past, but I am not going to repeat it here ). So, the next best thing, is a TIB single loop which LOOKS symmetric - although it is not. Dan Lehman tried to tie a TIB loop similar to the ABoK#1408 - but he forgot a second collar at the one side ! (1) For somebody who does not becomes dizzy looking at something so lopsided, it is not a bad knot. Intrigued by this attempt, I had tried my hand, and the result is shown in the attached pictures. It looks symmetric from any side you see it ! I, too, had added a collar, but not at one side, around the one end, but at the middle, around the eyelegs. 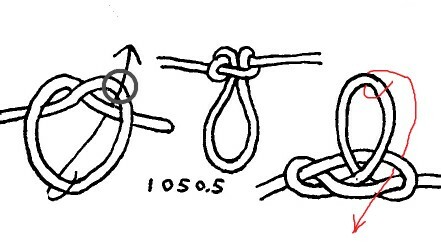 To tie it, just do what you do when you tie the Harness loop ( ABoK#1050 ), only that now you should first form a loop on the segment of the initial configuration, and then reeve the bight ( which will become the eye ) through this loop. In other words, this loop can be tied-in-the-bight in a glance. Can this loop be untied more easily than the golden standard of the TIB inline loops, the great Butterfly loop ? I do not know yet, I had not tried it under heavy loading ( 33%-50% of the MBS of the rope ) but I guess that it will. Ashley was quick to dismiss the Harness loop in favour of the Butterfly loop, but perhaps the humble Harness loop has some more twists than he had imagined ! It is not made from interlocked easily jamming overhand or fig.8 knots ( so, it is PET-2, just as the Linfit loop, tied by O. Nuttal ), and this may have some positive consequences regarding its untiability after heavy loading. P.S. I have added a picture showing the tying method, where I had oriented the initial configuration just like Ashley does, in his sketch of the Harness loop. In the image of Ashley, I have also added a small circle indicating where we have to form the loop, and reeve the bight through it. For the moment, I call this loop "Re-harnessed Harness loop" - the collar around the eyelegs looks like a harness, does nt it ? --but he forgot a second collar at the one side ! so lopsided, it is not a bad knot. (i.e., with one particular *end* only qua S.Part). can jam a butterfly, reportedly, to some degree). It crossed my mind to name this loop ( somewhat whimsically ) as : Re-harnessed Harness loop - the added "lower" collar around the eyelegs looks and works like one ( more ) harness. Any other/better idea ? The lineman's loop certainly looks more symmetric to me, I think because it is. so, it's #1050 harness loop with an extra tucking ? I had thought to present it like this, but it could mislead the reader to believe it is the Double Harness loop ( ABoK#1052), or something like it. The way I describe/call it reveals better the geometrical aspects of the knot ( the additional collar=harness around the eyelegs ), which is all that matters, not the topology or one of the many tying methods, which are secondary. Is this loop "directional" ? ? ...a directional eye knot --i.e., one that is intended to be loaded qua eye knot on one direction (i.e., with one particular *end* only qua S.Part). Personally, I am not sure that there is a sharp line dividing "directional" from "non-directional" inline loops - except, of course, from the cases where an inline loop is not a fixed end-of-line loop when it is hanged by one of its ends, at all ! ( like the inline variation of the Englishman s knot (1)). An inline loop may hold when it is hanged by either end, but it may jam or it may be deformed significantly ( i.e., be transformed geometrically and structurally ) when it is hanged by its one end, although it will remain easy to untie and retain its initial/same shape when it is hanged by the other.